The aftereffects of a Near-Death (NDE) or Spiritually Transformative Experience (STE) often involve profound changes, including special abilities to help others. 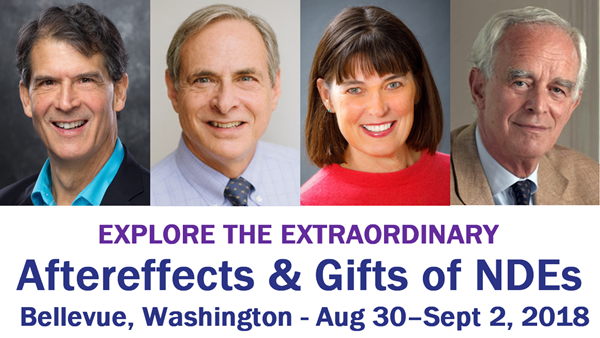 This conference provides a deeper understanding of these gifts, which allow us to live life with love, hope, joy, compassion, awareness, and connection to others. We have a number of special Featured Speakers! More about the IANDS Conference. CONFERENCE VIDEOS HAVE BEEN EXTENDED! – VIEW UNTIL DEC 31st! If you aren’t able to attend the Conference, you can Live Stream up to 22 hours of presentations and access them later Video On Demand on your smartphone, tablet or computer. The presentations will remain available until December 31st. Select either the Featured Presentations (7 speakers) or the Entire Video Event (20 speakers). Test 2 FREE Video samples below to check your browser! SAVE! IF YOU ARE AN IANDS MEMBER (or join for as little as $30), YOU GET 45% to 50% OFF! And you get all of the benefits of being an IANDS member for a year—our quarterly magazine Vital Signs, monthly NDE stories via email, member discounts and more! To get the member rate, you need to login as an active member before you register for Live Streaming. To join IANDS now, click here. Step 1: If you wish to receive the IANDS member rate, be sure you have an “active” membership before you register. If you already have an IANDS account, login to your account and make sure it says, “Your membership is currently active”. If you need to set or reset your password, click Forgot Password? using the email address for your account. To join as an IANDS member now, click here. Step 2: Select which package you want below and click the blue Register button. This opens the Live Streaming Registration page. Click on the “Register Online” button. If you already have an IANDS account, follow the prompts to login. Follow the steps to complete your registration. If you select Pay Later, your Live Streaming registration will not be complete until we receive your check. Step 3: You will receive an email with the subject “Confirming your IANDS Conference Live Streaming / VOD.” If you do not receive this email, be sure to check the email address you provided and also your spam folder. Step 1: Before the Conference, to check your Live Stream event registration, press the Login button (upper right corner of the window) and enter your username and password. No videos will be available until the Conference starts. Test that your browser will display videos by selecting one of the Free Video-On-Demand samples below. Step 2: On the day of your event, press the Login button (upper right corner of the window) and enter your username and password. (If you forgot your password, click Forgot Password?). When you have logged in, you will be sent to the Viewing Page for your package. The Live Stream video will be playable at the appropriate time by clicking the play button on the screen. If you experience any difficulty receiving the Live Streaming, just stand by for the Video Archive on your Viewing Page. Step 3: Within 60 minutes after a presentation, your selected Viewing Page will list the presentation as a Video Archive selection. If you wish to view the presentation, select it and click on the play button. The Viewing Pages will be accessible through December 31, 2018. FREE VIDEO ON DEMAND SAMPLES! Use these free VOD samples to test whether your Internet browser will display the videos. We hope you will enjoy viewing them.